Start this morning toward Raymond but go very slowly. Jon't Williams and I go two miles or more ahead of the regiment to find water. Marched some eight or nine miles and camp at the Mississippi Springs, a summer resort. The springs are grand. Four springs under one roof, large stone like crockery ware placed in each, a large spring in the center and the other three equal distance around it. Note: Much of the information used to describe these Day-By-Day accounts comes from a series of newspaper articles entitled Camp and Field, The Old 16th Ohio, written by 16th Ohio Corporal Theodore Wolbach, Company E, and published in the Holmes County (Ohio) Republican newspaper in 1881 and 1882. This website has a copy of the entire series of 78 chapters except for one, published April 13, 1882, which has not been located. The missing article covers the period between July 13 and 22, 1863, and, regretfully, reduces the facts and details that can be provided here for these ten days. Other sources and research will be used to provide the location and general actions of the regiment during this time. 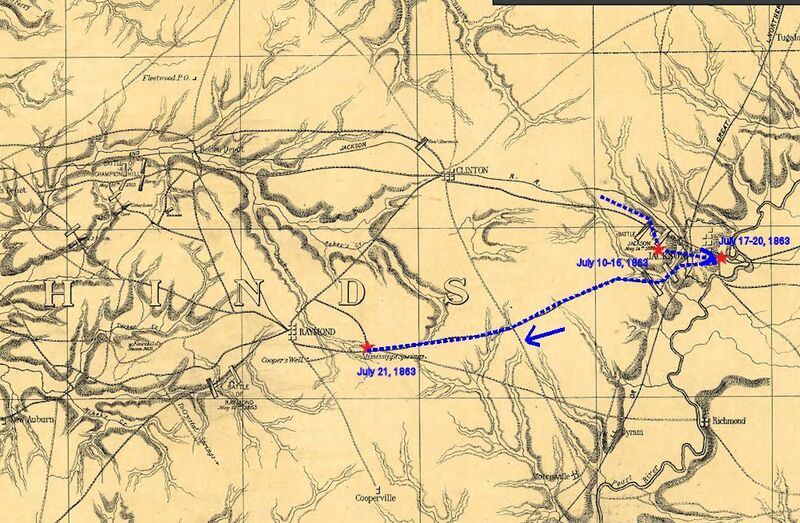 Period military map showing the approximate route of the 16th Ohio and their campsite at Mississippi Springs, Mississippi, just east of Raymond, on July 21, 1863. 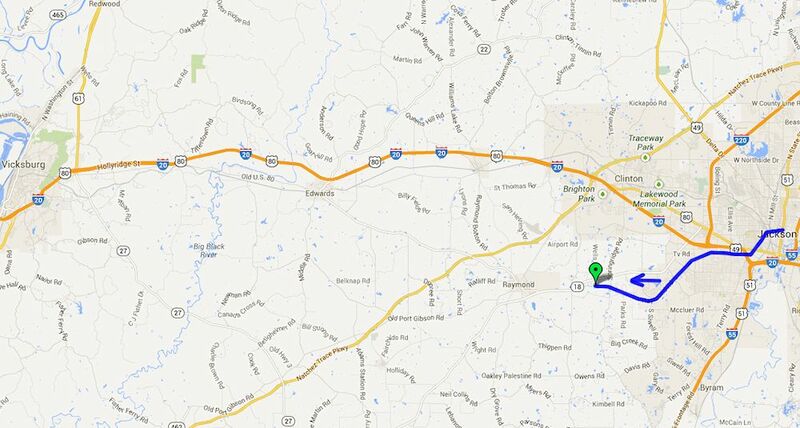 Green pin - Approximate location of Mississippi Springs, Mississippi, where the 16th Ohio camped the night of July 21, 1863.